The N492-08S-ST High-Density Fiber Adapter Panel (MMF/SMF) is designed specifically for use with Tripp Lite's N492-WM2-BK or N492-WM4-BK Wall-Mount Fiber Enclosures. 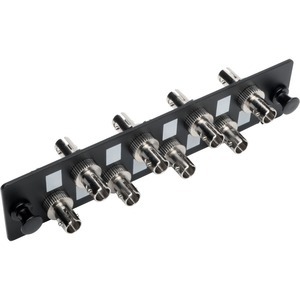 The pass-through panel features eight ST simplex connectors that work with both multimode and singlemode applications. It's easy to install-just snap the panel into the enclosure with no tools required. It's made from heavy-duty 1.2 mm cold-rolled steel that will last a lifetime. Dust caps are included to protect unused connectors from debris or damage.